Cells cultured in Lifeline® medium out-perform cells grown in any similar medium. You’ll get consistently reproducible results with Lifeline® media! Lifeline® media will support the growth of cells over a period of at least 15 population doublings. Lifeline® media contain no antimicrobials and no phenol red (except RPMI) — components which can cause cell stress and “masking effects” that may negatively impact experimental results. If you’re not achieving optimal results, it may be because you’re not using the medium optimized for the specific type of cells you’re working with. (more below) . . .
Lifeline® Culture Media . . .
Optimized SPECIFICALLY for the growth of each particular tissue and cell type. 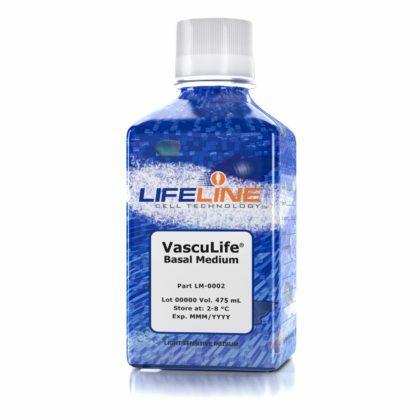 Each Lifeline® medium is available in kit form, to allow you to prepare fresh medium whenever needed, and to use the specific growth factors you wish to use. 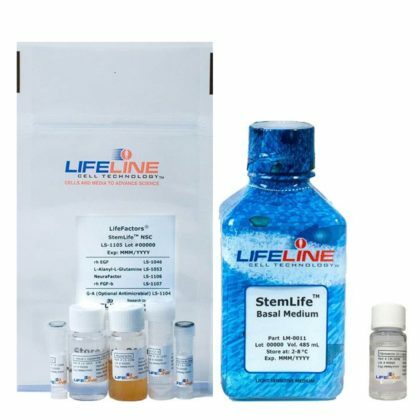 Complete Kits contain: basal medium, associated supplements and growth factors called “LifeFactors®.” This Complete Kit allows you to prepare fresh medium in your laboratory, extending shelf life and enhancing performance. Light-Protective packaging– each medium comes in a light-protected bottle, with a specially-designed shrink label that works as a light barrier to protect the medium from light damage. Optimally packaged for protection. A barrier sleeve protects the medium from contaminants found in the water bath. LifeFactors (growth factors and supplements) are packaged in a convenient gas-impermeable pouch for easy storage. Cell culture media bottles are recyclable, and we ship all products with biodegradable packing material.